When I finished my Atari 2600 homebrew game Gene Medic I couldn’t wait to make it ‘real’ by having an actual cartridge made. Fortunately, the folks down at Atari Age make it easy to do and provide this as a service. I had such a tremendous amount of satisfaction playing my game on original hardware with a real cartridge. Below are the instructions for having Atari Age make your own cartridge. Note that they cost $25 each. 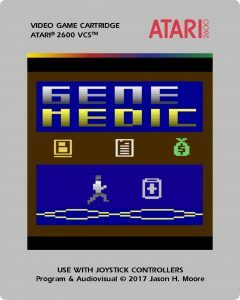 Step 1 – Make your label graphics Instructions are included on the Atari Age website for the dimensions of the label graphics. You can do this yourself with an appropriate graphic design software package. The easiest approach is to use the online Atari 2600 label maker. They provide templates for you to add your text and label art. This is what I did and it only took maybe 15 minutes to complete. I did the label art by cutting and pasting some screenshots of my game from the Stella emulator. As you can see below, I selected the newer silver label format that Atari used. This is easy if you already have your binary file like I did. Atari Age allows you to use binaries from other homebrew games if you have permission from the author. This is important because some sell their games for a profit. I don’t sell my game and consider it open source so have at it. They also indicate that they place a special reproduction label on the cart if the game is rare to prevent false sales on eBay. Good idea! When you are ready to place the order navigate to the Atari Age site. You must first choose the type of circuit board you want (legacy vs melody). They provide the details for these choices on the site. You then add to cart and pay. 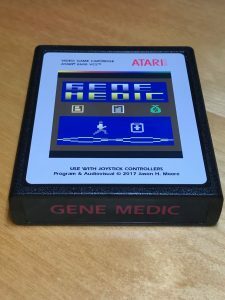 Once you pay you then need to email Albert at AtariAge.com with your label art and binary along with the order number so they can have the carts made. He was a real pleasure to deal with and I have my custom carts in no time (thanks Albert!). This is a great service provided by Atari Age. The carts look and feel just like the ones from back in the day. I can’t tell the difference. Feel free to order one or more copies of my game. You can get the binary, front label, and end label from the links in this sentence. Have fun!